Team Tar Heels defeated Team Carolina 25-24 in Mack Brown’s debut back in Chapel Hill thanks to an 18-point field goal at the end of the game. Yes, you read that right. An 18-point field goal. In lieu of a traditional game, Brown opted for a 65-play offense vs. defense scrimmage. In this light-hearted affair, Brown operated as head referee as well. Hence the 18-point “game winning” field goal at the end of the game by Noah Ruggles. It was pouring rain in Chapel Hill hours before kickoff, but the skies cleared as the Tar Heels took the field for pregame warmups. 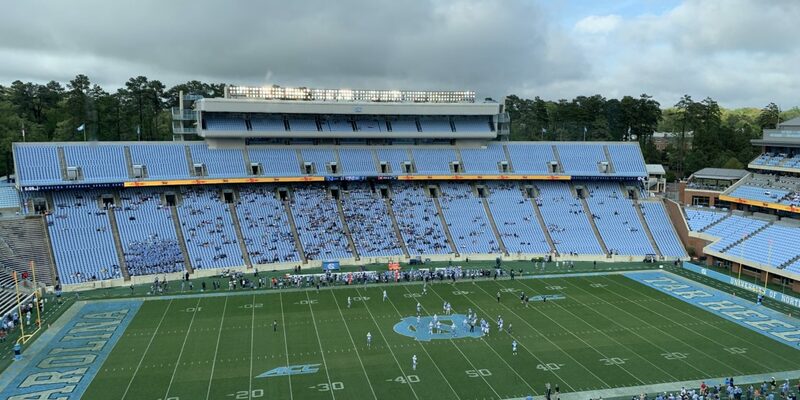 Although official attendance numbers were not given, the stands were packed with UNC fans eager to see Brown’s return to Kenan Stadium. The first score of the game came courtesy of Javonte Williams, who punched the ball in from 7-yards out following a 77-yard completion from Jace Ruder to Carl Tucker. A field goal and a 6-yard touchdown run from Ruder put Team Carolina ahead 17-0 before halftime. After halftime, a pair of true freshman got in on the scoring action. Team Tar Heels got on the board after the break with a 42-yard pass from Sam Howell to Roscoe Johnson. Not long after, Storm Duck recovered a fumble and returned it 44-yards for a touchdown as well. Both Howell and Duck were early enrollees from Carolina’s latest recruiting class and showed fans a glimpse of a bright future in Chapel Hill. Brown was complimentary of his team in his post-game press conference, saying they had cut down on penalties and worked to protect the ball. Carolina’s running back depth was also apparent in the game. Javonte Williams led all players with 67 yards on the ground to a tune of 6 yards per carry. Antonio Williams also contributed 16 yards on the ground. Williams, who transferred from Ohio State before last season, said after the game that he was buying in to Brown’s process. “When you don’t question it and trust the process, everything typically works out,” Williams said. Brown also said the term “Be The One” is the team’s motto, which focuses on stepping up in big moments. “Be the one on fourth down that Coach [Phil Longo] and I look to to run the ball,” Brown said. “Be the one on fourth down to be the pass rusher that gets to the sack. Be the one when you’re against Virginia Tech, you’ve got 4:23 left, 97-yards to go that gets the turnover. With UNC’s opener against South Carolina still months away, Brown and his staff will step back and evaluate the team heading out of spring. But for fans of North Carolina, Saturday’s spring game was an exciting taste of the future of football at Kenan Stadium. Entertaining game! Exciting team and fan spirit! Good to have you back, Mack. so, what does it look like when the stands are not packed with fans?